When it comes to New York, your first thought might be the magnificient skyline of the city, the bright lights and tall, towering buildings. However exciting the city is, your New York wedding celebration should be the main attraction, not the streets down Times Square or the popular Empire State Building. Travel up from Manhattan and discover an area of New York less dramatic, where things slow down and the natural, stunning beauty replaces the city's hustle-bustle. Upstate New York and the majestic Adirondack Mountains welcome you to the perfect place to say "I do." The inspiring mountain setting will charm everyone of your guests and create a truly unparalleled experience for your big day. Resting on the shores of Lake Placid and surrounded by the majestic peaks of the Adirondack Mountains is a truly magical setting for your New York wedding celebration. 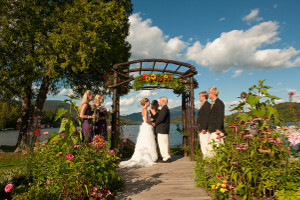 The Whiteface Club & Resort in Lake Placid features a selection of beautiful venues to choose from for your big day, including their popular waterfront garden for your ceremony, the charming Moose Lodge Boathouse Restaurant for cocktail reception and the Adirondack Dining Room for your elegant banquet. The stunning panoramic views of Whiteface Mountain are sure to enchant all your guests on your special day. And as the winner of The Knot’s Best of Weddings award for 2012, 2013, 2014 and 2015, along with The Knot’s Hall of Fame award for 2015, the Whiteface Club & Resort is where dream weddings really come true. The Sagamore in Bolton Landing, New York presents another charming lakeside wedding destination, this time overlooking beautiful Lake George. What makes The Sagamore stand out from other lakeside Adirondack retreat is its unique setting on the southern end of Green Island; this magnificent island destination offers breathtaking lake and mountain views and a truly inspiring setting where you can say “I do.” Enjoy your ceremony outdoors with the incredible scenery as your backdrop and choose from three luxurious options for your reception: the tented lakeside lawn where you can dance under the stars, a magical reception cruise out on the water on the Sagamore's luxurious baot, or indoors at their Tudor-style Club Grill which overlooks the resort's beautiful golf course! Sariha’s Pick: The Sagamore’s island setting makes it a destination wedding site that is sure to impress. 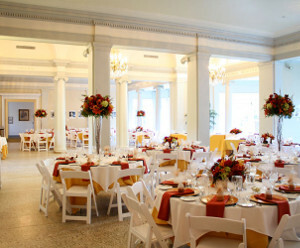 For a more intimate and memorable event, The Morgan stood out from the rest. The Morgan is a beautiful 72-foot replica of a 19th-century touring vessel, complete with an open-air, topside deck and a lower enclosed deck. Enjoy a relaxing four-hour reception that includes cocktails and hors d'oeuvres and a gourmet dinner for up to 75 guests. The magnificient views of the mountains and the quiet waters of Lake George truly make this a wedding celebration that can't be beat! Located in the Champlain Valley, in the charming town of Essex, New York, is a 200-acre destination where your wedding day is sure to be something truly special. Black Kettle Farm takes you away from the hustle-bustle so you can focus solely on your friends, family, and of course, yourself. Exchange your vows in their lush orchard where the guests sit on hay bales, and settle down for a memorable reception at the rustic yet elegant barn. Black Kettle can also arrange for a relaxing walk down to visit the horses before turning up the music for your first dance as newlyweds! Get as close as you can to nature on your wedding day when you plan an event with the Lake George Steamboat Company. Their memorable wedding services includes an incredible cruise out on the waters of Lake George; the 190-foot Lac du Saint Sacrement is the largest cruise ship on the inland waters of New York and can host up to 400 guests, while the smaller Mohican can host up to 150 and is the oldest continuously operated tour boat in all of America. The company's ship captains are fully-licensed marriage officials who will oversee your ceremony and the ships' private rooms offer plenty of space for your relaxing lunch or dinner reception. No matter how you plan your grand wedding experience, Lake George Steamboat Company will make it one to remember. Established in 1986 as the only museum in the United States that is dedicated entirely to dance, the National Museum of Dance & Hall of Fame might not seem like an obvious choice for your New York wedding. However, this elegant destination offers a prime setting in the heart of the Saratoga Spa State Park, right along the foothills of the Adirondack Mountains, making it a unique getaway that will set your event apart from the rest. The museum features a selection of onsite venues including a stunning marble foyer, a secluded courtyard, and the bright, airy gallery. Whichever you choose, you’re sure to experience a magical wedding event with your loved ones.